In my most recent post, I talked about running a MEAN stack with Docker Containers. Manually deploying Containers is all fine and dandy, but is rather fragile and clumsy. What happens if the app crashes? How can the app be updated? Rolled back? This post is going to be a longer deep dive into the world of containers. I am assuming you have read / completed part one. There is a lot of content, but if you just skim through, it should take only around 15 minutes for all the steps! Thankfully, there is a system we can use to manage our containers in a cluster environment called Kubernetes. 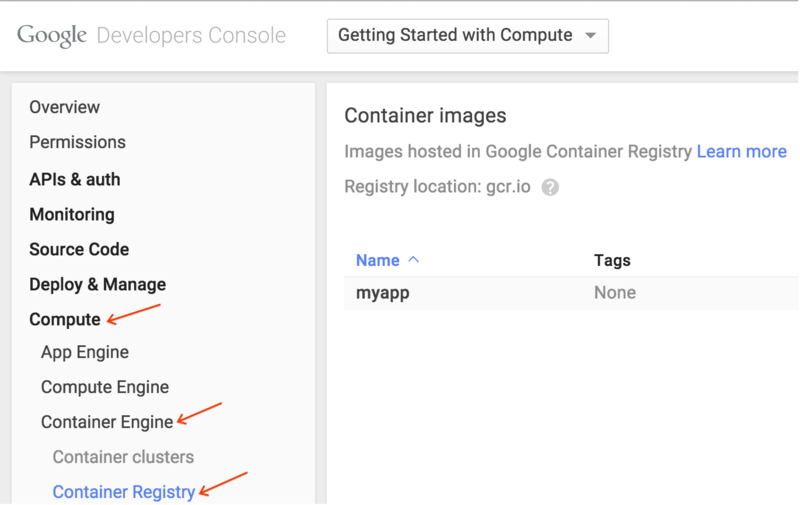 Even better, Google has a managed version of Kubernetes called Google Container Engine so you can get up and running in minutes. At Google, it is rare that someone actually logs into a production machine to perform updates. With millions of servers, you can see how this would become impossible. Manually logging into servers also leaves room for human error. Instead, we use a system called Borg to do the management for us. In a nutshell, you tell Borg to run X copies of your job, and Borg will do it. Job dies? Borg will start a new one. Health check failing? Borg will shut that job down and start a new one. We took the lessons learned from Borg, and made an open source project called Kubernetes. Kubernetes lets you manage a cluster of machines and run containers on top of it. Pretty cool stuff, and it just reached version 1.0! Before we jump in and start kube’ing it up, it’s important to understand some of the fundamentals of Kubernetes. Containers: These are the Docker, rtk, AppC, or whatever Container you are running. You can think of these like subatomic particles; everything is made up of them, but you rarely (if ever) interact with them directly. Pods: Pods are the basic component of Kubernetes. They are a group of Containers that are scheduled, live, and die together. Why would you want to have a group of containers instead of just a single container? Let’s say you had a log processor, a web server, and a database. If you couldn't use Pods, you would have to bundle the log processor in the web server and database containers, and each time you updated one you would have to update the other. With Pods, you can just reuse the same log processor for both the web server and database. Replication Controllers: This is the management component of Kubernetes, and it’s pretty cool. You give it a set of Pods, tell it “I want three copies of this,” and it creates those copies on your cluster. It will do its best to keep those copies always running, so if one crashes it will start another. Services: This is the other side to Replication Controllers. 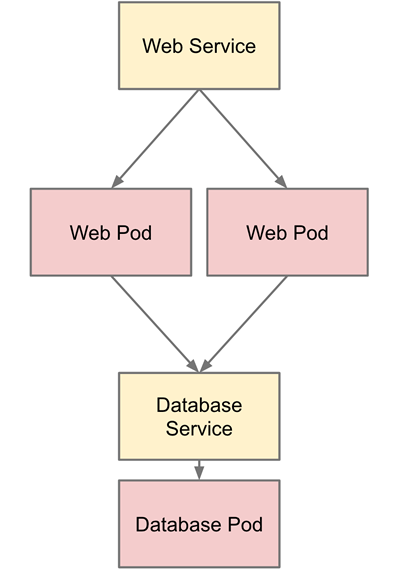 A service is the single point of contact for a group of Pods. For example, let’s say you have a Replication Controller that creates four copies of a web server pod. A Service will split the traffic to each of the four copies. Services are “permanent” while the pods behind them can come and go, so it’s a good idea to use Services. In my previous post, I used off-the-shelf containers to keep things simple. I had a stock MongoDB container and a stock Node.js container. The Mongo container ran fine without any modification. However, I had to manually enter the Node container to pull and run the code. Obviously this isn't ideal in Kubernetes land, as you aren't supposed to log into your servers! Instead, you have to build a custom container that has the code already inside it and runs automatically. To do this, you need to use more Docker. Make sure you have the latest version installed for the rest of this tutorial. Before starting, let’s get some code to run. You can follow along on your personal machine or a Linux VM in the cloud. I recommend using Linux or a Linux VM; running Docker on Mac and Windows is outside the scope of this tutorial. This is the same sample app we ran before. The second line just moves everything from the EmployeeDB subfolder up into the app folder so it’s easier to access. The third line, once again, replaces the hardcoded localhost with the mongo proxy. First, you need a Dockerfile. This is basically the list of instructions Docker uses to build a container image. Dockerfiles are pretty self explanatory, and this one is dead simple. First, it uses the official Node.js image as the base image. Then, it creates a folder to store the code, cds into that directory, copies the code in, and installs the dependencies with npm. Finally, it specifies the command Docker should run when the container starts, which is to start the app. This will build a new Docker image for your app. This might take a few minutes as it is downloading and building everything. $ docker build -t my-user-id/myapp . But I'm going to ignore this practice in this tutorial. At this point, you should have a server running on http://localhost:3000 (If you are on Mac or Windows, this won't be so simple). The website will error out as there is no database running, but we know it works! Now you have a custom Docker image, you have to actually access it from the cloud. As we are going to be using the image with Google Container Engine, the best place to push the image is the Google Container Registry. 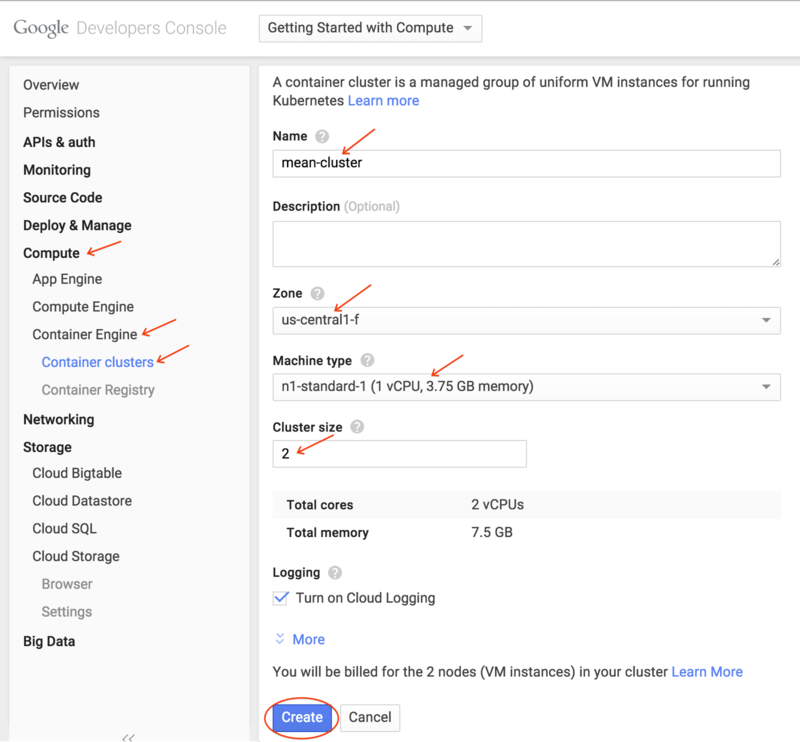 The Container Registry is built on top of Google Cloud Storage, so you get the advantage of scalable storage and very fast access from Container Engine. First, make sure you have the latest version of the Google Cloud SDK installed. Then, make sure you log in and update. Now you can push the container. We need our Google Cloud Project ID (we made one in part one). After some time, it will finish. You can check the console to see the container has been pushed up. So now you have the custom container, let’s create a cluster to run it. Currently, a cluster can be as small as one machine to as big as 100 machines. You can pick any machine type you want, so you can have a cluster of a single f1-micro instance, 100 n1-standard-32 instances (3,200 cores! ), and anything in between. There are two ways to create this cluster. Take your pick. After a few minutes, you should see this in the console. Pretty simple, just pick the same zone as your cluster and an appropriate disk size for your application. Now, we need to create a Replication Controller that will run the database. I’m using a Replication Controller and not a Pod, because if a standalone Pod dies, it won't restart automatically. Pretty straightforward stuff. We call the controller mongo-controller, specify one replica, and open the appropriate ports. The image is mongo, which is the off the shelf MongoDB image. Again, pretty simple stuff. We “select” the mongo Controller to be served, open up the ports, and call the service mongo. This is just like the “link” command line option we used with Docker in my previous post. Instead of connecting to localhost, we connect to mongo, and Kubernetes redirects traffic to the mongo service! kubectl is the Kubernetes command line tool (automatically installed with the Google Cloud SDK). We are just creating the resources specified in the files. Once you see the mongo pod in running status, we are good to go! Now the database is running, let’s start the web server. Here, we create a controller called web-controller, and we tell it to create two replicas. Replicas of what you ask? You may notice the template section looks just like a Pod configuration, and that's because it is. We are creating a Pod with our custom Node.js container and exposing port 3000. The type is LoadBalancer. This is a cool feature that will make Google Cloud Platform create an external network load balancer automatically for this service! We map external port 80 to the internal port 3000, so we can serve HTTP traffic without messing with Firewalls. 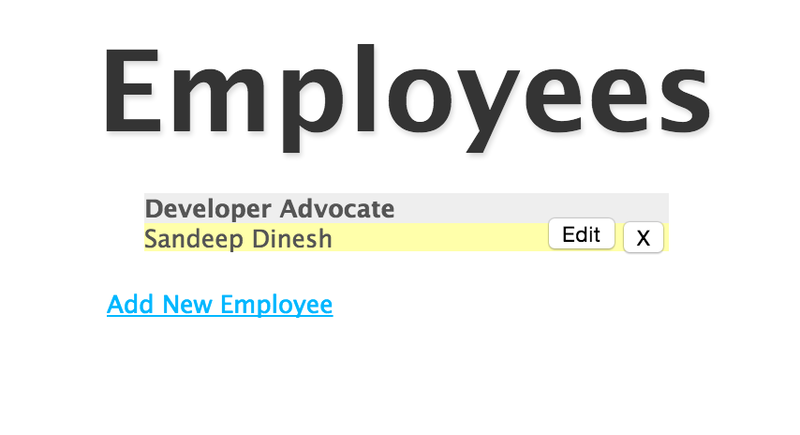 Once you see the web pods in running status, we are good to go! If you go to the IP address listed, you should see the app up and running! By using Container Engine and Kubernetes, we have a very robust, container based MEAN stack running in production. In my next post, I'll cover how to setup a MongoDB replica set. This is very important for running in production. Hopefully I can do some more posts about advanced Kubernetes topics such as changing the cluster size and number of Node.js web server replicas, using different environments (dev, staging, prod) on the same cluster, and doing rolling updates.